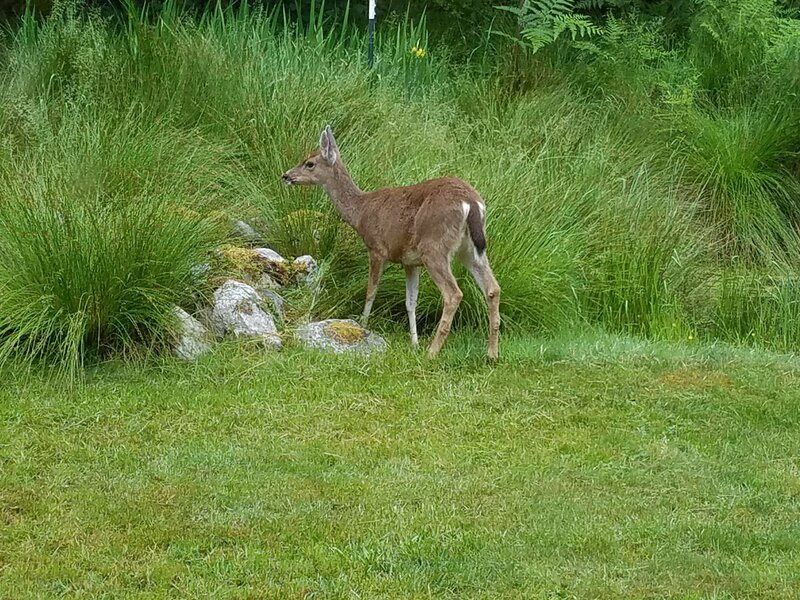 I woke to Hubs saying quietly “Honey — there’s a deer in the yard.” The description of our AirBnB had mentioned this possibility and sure enough, a small doe nibbled her way through the yard while we watched. The sun shone in blue skies above, only a few puffy white cloudlets left as a token of yesterday”s rain. We took our time, having a cup of coffee and showering before getting on the bikes to go in search of breakfast. I had looked up most of the restaurants in Lopez Village, which is a tiny place, and knew we didn’t have many options. I didn’t want us just to go back to The Galley, where we’d eaten dinner the night before — seemed unimaginative. We checked Vita’s Wildly Delicious, recommended by many, but it was closed. Holly B’s Bakery, which was supposed to be closed, was fortunately open, as was Lopez Coffee Shop next door. My almond butterhorn from Holly B’s was delicious, buttery rich with a touch of whole wheat flour that totally made it into health food. The wooden bike racks provided by Lopez Island Bikes & Kayaks are everywhere we go. Not my favorite bike rack design but it’s sure nice to see so much bike parking provided. Hubs checked out Village Cycles across the street while I popped into Lopez Bookshop with my guess on their trivia question outside the door. Nailed it, in no small part thanks to having read all of the works listed and some more than once. * See if you can guess; I’ll put the answer at the end of the post. For my accurate guess I won a chocolate kiss (could have had a cat or dog sticker but chocolate rules). I picked out a couple of cards for future birthdays and just-because and got two books: Einstein & the Art of Mindful Cycling by Ben Irvine and Silence in the Age of Noise by Erling Kagge, who walked alone to the South Pole. Made a stop at the Lopez Village Market (bigger than Blossom Grocery, more items such as the alcohol wipes we needed to clean brake pads) and got a few deli case items that will serve as lunch or dinner, then stepped into Lopez Island Thrift so Hubs could ask about an electronic part just in case they had it and I could scan the shelves for another apple to add to my collection (no luck this time). A #bikesmeanbusiness sidebar for tourism promoters and Chambers of Commerce: Note that we have spent money in every town we’ve been in. We stop for coffee, we pick up groceries, we go out to eat, I buy wine and art and books and mementos, we restock bike supplies. We don’t just pass through towns, we stop in them. Stopping means spending and people on bikes are guaranteed to stop more frequently than people in cars. Certainly not every rider would spend a couple of hours poking around in local shops the way we did today, but every last one is fueled by calories and will be refueling along the way. Sweet little e-bike with awesome basket panniers parked at the thrift shop. The beautiful little backyard oasis drew us back to relax, read, and generally laze around. When you’ve put in nearly 9 (admittedly super easy) miles just to get breakfast and shop you need feel no guilt. The bike ride to and from our stay always involves some ocean breezes as we ride along a narrow road on a skinny spit. I should note that the traffic was simply horrendous. I think we were overtaken by TWO WHOLE DRIVERS on our way to breakfast and AGAIN on the way back. Can’t stand this intensity. After some reading and possibly a small nap with a gentle breeze blowing past, we walked up the road to explore the Fisherman Bay Nature Preserve on the end of the spit. After a walk through deep and beautiful woodsy spaces we came out into open meadows, wetlands, and that fresh ocean breeze. We made our way down to the shore and walked along, looking at the boats floating in the harbor and poking at interesting rocks and shells. A bald eagle swooped close by — the closest I’ve ever seen one — before coming to roost on top of a large pole and surveying their domain. The peaceful walk to and from the preserve. The woods are lovely, dark and deep. After our walk I did another hour of what I’m going to dub “yard yoga” on the grass next to the little pond, with frogs croaking, birds chirping, and the sound of running water. We’re going to rough it with more reading, relaxing, and some island wine to go with our dinner from the deli case before we get a good night’s sleep. Wildlife: Deer, bald eagle, birds and frogs galore. * Of course I didn’t forget about the bookstore trivia. The line “Believing takes practice” is from A Wrinkle in Time by Madeleine l’Engle, one of my favorite books as a kid.